Put some artful U.S. history in your surroundings with these detailed posters. From early firefighters to the evolution of aviation, these illustrations show how uniforms, equipment and more evolved throughout the years. And each one is Made in the USA. The way History America creates each poster is (almost) as interesting as the history it honors. After careful research, models reenact looks throughout the decades—and centuries. From muskets to fatigues, the costumes and props capture the essence of each era. Founder Mark Waterman photographs as many as 1,000 shots of each look, then the artists at History America paint the final images for a striking effect. Mark has always been interested in history and became intrigued by the evolution of firefighter’s gear. He decided to create a visual way to honor it. From there, he took more vocations that not only preserve the past, but also bring it to life. Hello everyone! I'm proud to introduce History America prints to The Grommet. I'd be happy to answer any questions you have! These are cool! Where can I find the complete list of themes? @Barry It looks like below you were able to find the complete list! We have all of them listed on the product pages for the items, which you can find links to above. The Grommet has all10 titles available for sale, just click on the buy box thats titled, Themed Historical prints. Hello, Mark. I see you have a number of these prints, which I think are awesome. I was looking for a particular one that I see you don't have. Do you think it might be possible for you to develop something like this for the railroad industry? My dad worked for the railroad all his life and I was thinking it'd make a wonderful father's day gift. Thank you. Do you ever plan on coming out with any sports related history posters? 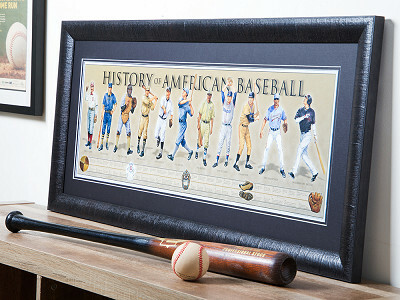 @Cassidy We have a baseball print available on the Grommet and we are currently working on History of American Football, with a fall 2017 release. 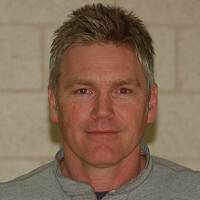 Hi Mark! I love the look of your prints, and love history myself so though I would invest in your work. A collection in each of my vacation homes would be a nice consistent thread across the states! But I am a woman,and looking through your offerings, history does not include me. Lucky for you men do a lot of shopping. @Elizabeth A. We are working on the print History of Women in the Military due to be released in 2018. 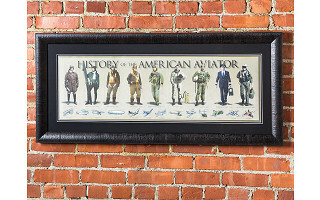 We also have woman in the Aviator and Navy prints. Thank you. @Mark @Elizabeth A. Was just about to make this same comment. Last I checked, women were in all branches of the military and have long served as firefighters and police officers. I understand you had to start somewhere, but as a representative of (at least) 50% of the population, for me the omission was glaring. @Elizabeth We strive to be historically accurate. For example there are less than 4% of women that are firefighters but we still placed a women in the modern day spot. 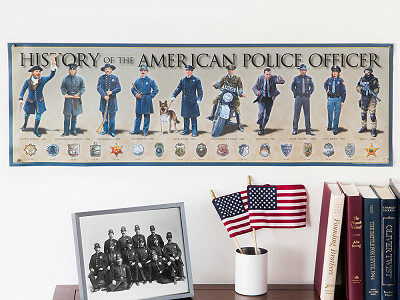 We also have a women in the History the American Police Officer as well. The Soldier and Marine prints are strictly ground infantry and women were just recently allowed in active combat. Thank your sharing. @Mark Wanted to add a voice to this conversation. I agree with Elizabeth - and glad to hear that you are adding women to your line. Wish there were one in the aviation line! I would have purchased that one. Great idea. 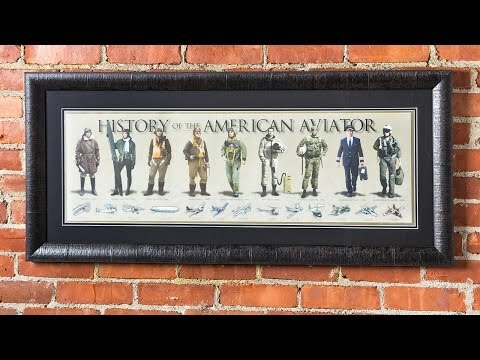 @Betsy The Aviator actually does have a female pilot included! The second figure from the left represents a 1920s female pilot. Thanks Mike, that is correct. Are these made in the U.S.? Also, what will the next Military print be? @David Hi David, yes our prints are created and made in the USA. 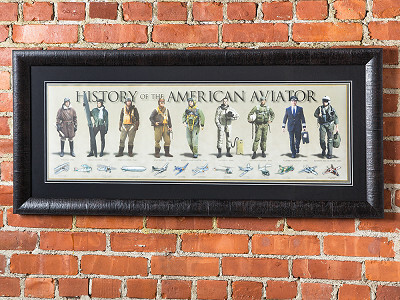 Our next military print will be History of the United States Air Force. Thank you.